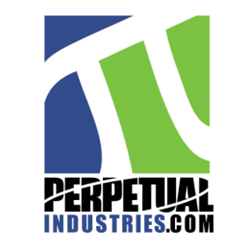 Perpetual Industries Inc. (OTC:PRPI), a developer of new and innovative energy efficient products, today announced that its President and CEO, Brent W. Bedford, will present at the National Investment Banking Association (NIBA) conference in Fort Lauderdale, FL, on Thursday, December 11. Mr. Bedford will present to hundreds of broker dealers, fund managers, and capital markets service providers on Perpetual’s unique mechanical technology, called XYO, which is used for automatically balancing rotating parts in machines so that they produce less vibration and operate more efficiently. He will also meet privately with interested parties to have in-depth discussions and be available for one-on-one meetings at the three-day NIBA conference held December 10-12 at The Westin Beach Resort & Spa, Fort Lauderdale, FL. NIBA is a national not-for-profit trade association of regional and independent brokerages, investment banking firms, institutional investors, and related capital market service providers. NIBA’s membership is multinational, representing more than 8,800 registered representatives with an estimated $78 billion in assets under management, and its member firms are responsible for 90% of all Initial Public Offerings under $20 million. Since 1982 (over 30 years), NIBA Members have completed over 1,000 deals that have raised over $10 billion dollars for emerging growth companies. The NIBA Membership represents over 60 services centered around micro-cap and small-cap companies. Incorporated in Nevada and based in Calgary, Alberta, Perpetual Industries Inc. (OTC:PRPI) is an emerging growth company focusing on research and development of new and innovative energy efficient products. Its automatic, mechanical technology, called XYO, is used for balancing rotating parts in machines so that they produce less vibration and operate more efficiently. Perpetual sublicenses XYO to third parties and directly develops and manufactures products containing XYO. For more information, please visit: http://www.perpetualindustries.com. We caution you not to rely unduly on our forward-looking statements. Investors should consider our Securities and Exchange Commission (SEC) filings, including our Registration Statement on Form S-1, Annual Reports on Form 10-K, and Quarterly Reports on Form 10-Q, especially the “Management’s Discussion and Analysis” and “Risk Factors” sections, and our Current Reports on Form 8-K.